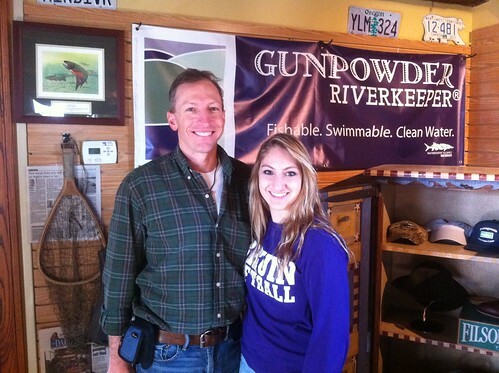 Gunpowder RIVERKEEPER Volunteers Earn Service Hours! My heartfelt thanks goes out to Bronte and Lane Thurgood for volunteering with Gunpowder RIVERKEEPER to fix up the wader wash stations along the Gunpowder River. The father and Daughter team drove all the way up from Fairfax County to volunteer. Bronte is currently taking an environmental science class that spurred her interest in Didymo and the measures MDDNR and Gunpowder RIVERKEEPER have taken to minimize the spread of the invasive algae. Theaux showed us a short clip on didymo and instructed us on our project of servicing 8 wader wash stations on the upper Gunpowder in and around Gunpowder Falls State Park. Didymo was first found in Maryland in May 2008 in the Gunpowder River. In December 2009, it was found in Maryland’s Savage River. It had previously been located in Virginia in 2006 and West Virginia in 2008. First, we dumped out the dirty contents of the wader wash stations:Then added 5 cups of salt, filled with water, and mixed.Although that, [the didymo] doesn’t look that bad, the strands grow and grow and turn white and then disintegrate and travel downstream throughout the water column. In cold years (this one is NOT a cold year), the didymo thrives, literally blanketing the streambed in places. Then with the warming waters of spring, the didymo begins to break up and float downstream in pieces that look like small shreds of toilet paper. The first time I fished the Gunpowder was in April two years ago after a cold winter and I was amazed. I found the disintegrating didymo at all levels of the water column, attached to rocks, branches and sunken logs, rolling in the current like long strands of toilet paper. Even a dry fly would get gunked with disintegrating didymo in one or two drifts. It was terrible. We also took two trash bags and filled them with beer cans, bottles and the like strewn at the 8 stations. Additional wader wash stations will be added soon. One is a replacement for a station destroyed in flooding this fall. It was a beautiful day spent on a beautiful river. This entry was posted in news on February 28, 2012 by Theaux Le Gardeur. Please join us for a fly fishing school. On Sunday, March 25, a Backwater Angler Guide will be teaching a fly fishing school that is ideal for beginners. If you’re planning on flyfishing Maryland, or anywhere else for that matter, this course is a great introduction to the sport. The school covers knots, casting, gear and fly selection. Class is held from 11:00 AM till 2:00 PM. Cost is $100 per person and includes the use of gear. A Maryland non-tidal fishing license and trout stamp is required and may be purchased at the shop with check or cash the day of the school. Class size is limited to 4 and pre-registration is required. Please give us a call at 410-357-9557 or drop us a line at info@backwaterangler.com to pre-register. This entry was posted in events on February 24, 2012 by Theaux Le Gardeur. Please join us for a fly fishing school. On Sunday, March 18, a Backwater Angler Guide will be teaching a fly fishing school that is ideal for beginners. If you’re planning on flyfishing Maryland, or anywhere else for that matter, this course is a great introduction to the sport. The school covers knots, casting, gear and fly selection. Class is held from 11:00 AM till 2:00 PM. Cost is $100 per person and includes the use of gear. A Maryland non-tidal fishing license and trout stamp is required and may be purchased at the shop with check or cash the day of the school. Class size is limited to 4 and pre-registration is required. Please give us a call at 410-357-9557 or drop us a line at info@backwaterangler.com to pre-register. 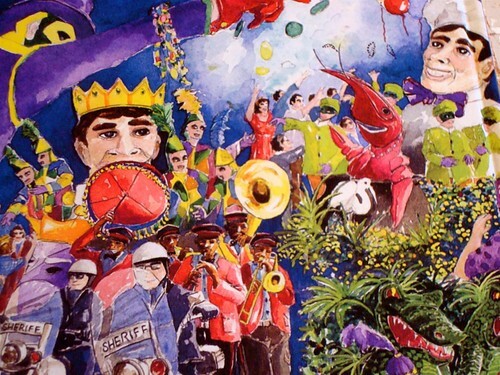 This entry was posted in events on February 22, 2012 by Theaux Le Gardeur. 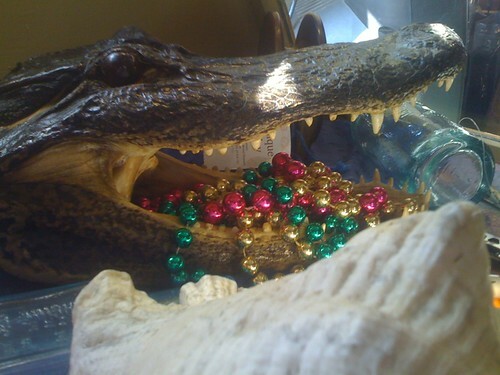 This entry was posted in fishing report on February 21, 2012 by Theaux Le Gardeur. 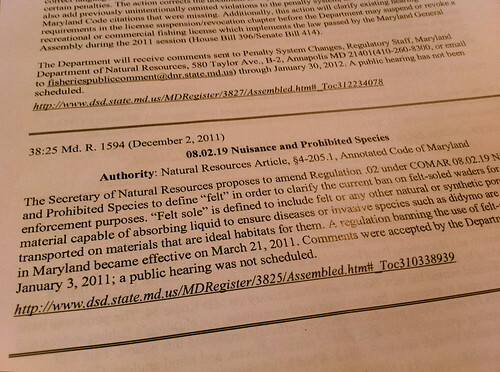 The Secretary of Natural Resources proposes to amend Regulation .02 under COMAR 08.02.19 Nuisance and Prohibited Species to define “felt” in order to clarify the current ban on felt-soled waders for enforcement purposes. “Felt sole” is defined to include felt or any other natural or synthetic porous material capable of absorbing liquid to ensure that diseases or invasive species such as didymo are not transported on materials that are ideal habitats for them. This entry was posted in news on February 15, 2012 by Theaux Le Gardeur. It’s hard to complain about this winter’s weather – although last Saturday was one of the exceptions to this winter’s rule of warm temperatures and sun. 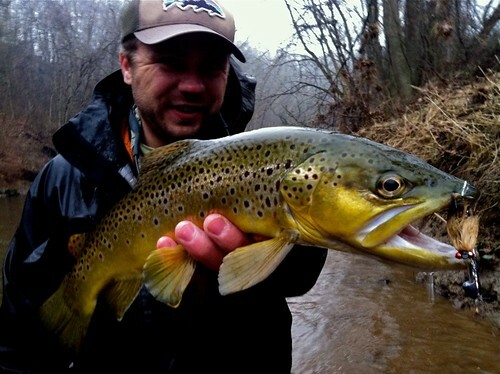 Despite the rain and snow we had some great fishing on nymphs and streamers. My home water of steelhead alley is typically frozen this time of year, but with the unseasonably warm winter, the streams have stayed open and the fishing has been very good there as well. Here are some highlights from the past few weeks for your blog. 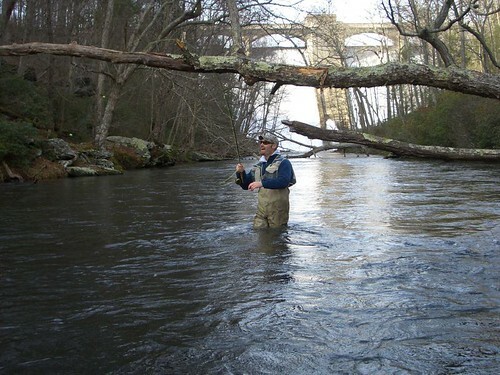 This entry was posted in fishing report on February 10, 2012 by Theaux Le Gardeur. As the frost was turning to vapor, a Bald Eagle flapped noiselessly downstream under the canopy of Poplars and just over the River Birch to drop into a Sycamore snag over a long, green flat. The Gunpowder River is flowing at 157 CFs, is clear and 42 degrees. The River has dropped in flow while warming a bit in temperature the past week. Black Flies are just starting above Falls Rd. Stoneflies are about in the lower river in the #14-16 range and throughout the catch and release section. These flies are tough to see without snow on the ground so as you’re walking the trails check your jacket sleeve every once in a while–then try a quill winged stonefly pattern in the flats and a deer hair stonefly pattern in the riffles. The wild fish have been slow to show themselves on the surface so fishing emergers that imitate the black flies can be an effective way to pass the time until one glimpses a rising fish-use enough split shot on the leader to get stuck in the gravel every half dozen casts. Snowshoe rabbit snow fly patterns are a good bet above Falls Rd. Streamers, dead drifted along log jams and cut banks have resulted in a few larger fish this week, including a 19″ wild Brown that Tom reported today. 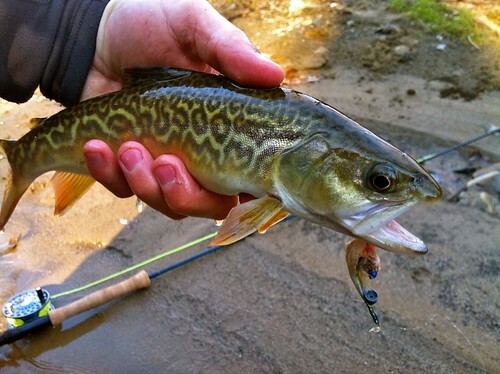 This entry was posted in fishing report on February 3, 2012 by Theaux Le Gardeur.